As a child, Robert, a pianist, and composer, started playing around with a saxophone and drums. Michael, a trumpet and flugelhorn player, and composer, played guitar. In 1987, when Robert was 9 and Michael was 8, the family moved from Queens, N.Y., to South Miami, and music became part of their formal education. After attending the New World School of the Arts, the brothers received full scholarships to the University of Miami and in time moved to New York. Their professional careers have unfolded apace, including appearances and recordings with artists such as Chick Corea, Roy Haynes, Charlie Haden, Arturo Sandoval, Ray Barretto, and Eddie Palmieri. 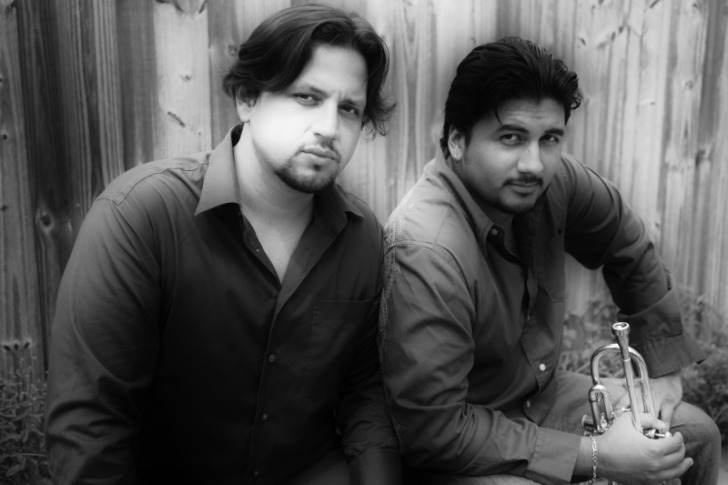 In 2002, the brothers formalized a lifetime of playing together, formed their own group, featuring a classic blend of Latin music and post-bop jazz, and recorded the first of their four albums. In a conversation to preview the quintet he leads with his brother, Robert Rodriguez spoke about growing up in South Florida, the many accents of Latin jazz and the lessons he learned playing with jazz masters. It sounds like as a kid, you took the musical instruments around the house as your toys. How did growing up in the Rodriguez household shape you and your brother as musicians? We only started to really get serious about music after we moved to Miami. We always wanted to be like dad. Dad was always traveling, so when he was back, we would have a new song for him ready to go. And by the time we were 11, 12 years old, we had a band. We would play covers. It was called the Tropics Kids, and we would go to [TV shows] “La Feria de la Alegría” and “Sábado Gigante.” We were very fortunate because there were quite a few places in Miami where we could play, and my dad would take us to his gigs and sometimes … I would actually jump in and help out. I started working when I was like 14, 15 years old, doing club dates around Miami. We were always into music. My dad also had a great record collection, and we were not only listening to the classic jazz records by Miles [Davis] and Art Blakey and all that, but also the great recordings of Latin music and Cuban music coming from Cuba, Irakere, Arturo Sandoval, Paquito [D’Rivera], Chucho Valdés, and we always wanted to be a part of those traditions. The sound of the Rodriguez Brothers mostly follows the classic mix of Afro-Cuban music and mainstream jazz, but you are not entirely comfortable with the “Latin jazz” label. Why? People call this “Latin jazz” and that “jazz,” and to me, it’s all jazz. Latinos have been part of the history of American jazz from the very beginning, from New Orleans to Chano Pozo with Dizzy [Gillespie] to now, so I don’t like the division. Me and my brother always wanted to be jazz musicians. But the music that surrounded us also included Cuban music and music from South America. I’m such a fan of Brazilian music. It’s one of the most beautiful musics in the world. All that is inside us, we didn’t have to mix it up, and I like to think that’s what jazz is. You and Michael ended up playing with some of the musicians you idolized growing up. Any lessons or anecdotes to share from those experiences? Let me just say it’s been kind of surreal: I had to pinch myself sometimes because I really got to work with people like Arturo [Sandoval], Paquito [D’Rivera] and so has my brother, and he’s now working with Chick Corea. These are our heroes. One of the things you learn on the bandstand is that jazz is such a democratic thing. It’s a give and take. You really have to listen to each other and open your ears and your heart to play this music at the highest level. As for stories, I was very fortunate to record and perform with Roy Haynes, a legendary drummer who has worked with everybody from Charlie Parker and John Coltrane to you name it. So we are at a gig, and he asks me, “So, what do you want to play?” And I said, “Oh, let’s play ‘Well You Needn’t,’ ” and he goes, “Nah, I played that already.” And then, it dawns on me: Of course he did, and he probably played it with Monk himself! This story first appeared on Artburst Miami.